Home › Life's Lessons › Relationship Question: Do you consider a past relationship a failure or a lesson learned? As the song goes, “Breaking up is hard to do!” And for many of us we loved some aspect of being in a romantic relationship with someone. Perhaps it was having someone who seems to care about us, or someone to make plans with for the weekend, to travel with or with whom to have physical closeness. So when the relationship breaks up, even though we know in our hearts that this is not the right person for the long haul, and we feel the loss in our life. Instead of looking at your past relationship as a failure, the relationship question to ask yourself is, “what new information about yourself did you gleam? Also, what was not working for you?” Pay attention to this! For example, a male client in his mid 40’s dated a very nice woman for 2 months. When he came to his coaching call, he did not seem excited about seeing his girlfriend this coming weekend. However, he did say he enjoyed her company and they always had a nice time together. The relationship question I asked him was, “Do you look forward to seeing your girlfriend?” His answer was, “Not really”. When we got to the heart of the matter there were lifestyle expectations that were not aligned with her. He did not see himself with his girlfriend for the long haul. Although they both wanted to get married and have a family, however, something critical was missing. After our coaching call, he decided to break up sooner than later so both could move on and seek a better fitting life partner. What my client discovered about himself is a critical piece of information that will help him refine his search and I know that he will make a much better choice next time that will lead him to the right person. Consider dating as a feedback loop of information. Eventually you will find the relationship that is the best fit! When I look at my dating history, with each relationship I learned very important pieces of information about what I needed to be happy in a relationship until I recognized with my husband that he was the one! So how would you answer this relationship question: What critical information did you learn from your past relationships? Also, how did this new insights about yourself impact how you evaluate a potential life partner? This curious coach wants to know! PS. 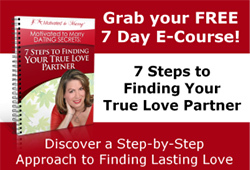 If you want to learn more about my proven Motivated to Marry Dating Secrets System to Find True Love fill out my brief informational survey at www.TalkwithCoachAmy.com so we can explore how to get your dating on the right track! ‹ Watch out for jumping to conclusions in dating relationships too soon!